If you’re not yet familiar with the ROSS (transitioning to ROSE) project, please check out its main page HERE. This was my first time on a deployment with the Ocean Mixing Group to take our robotic aquatic sampling kayaks up to the LeConte Glacier face in Alaska. This massive and extremely fast moving glacier is a researcher’s haven for useful data about how melting glaciers interact with the ocean. 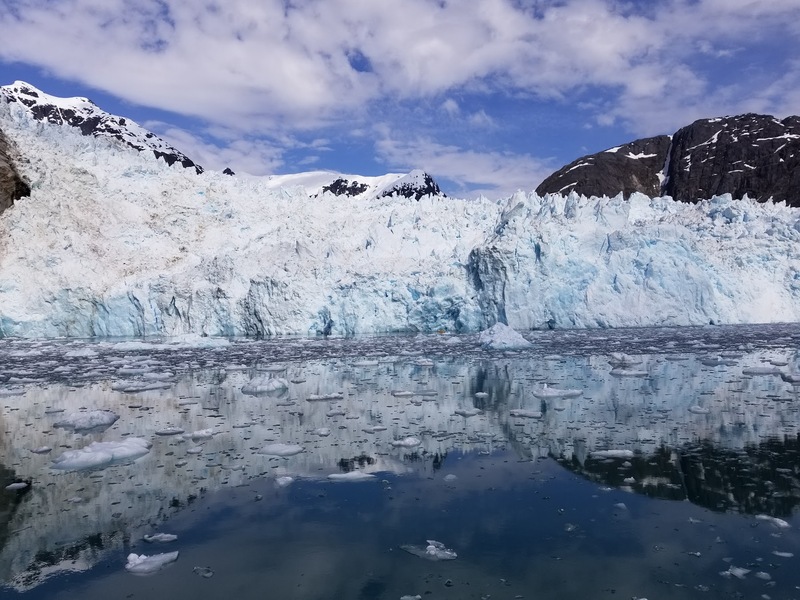 Due to its frequent calving and difficult to reach location, the ROSS kayaks are ideal for driving right up to the face of the glacier to get useful current, temperature, salinity, and pressure data where no one has ever been able to get such data before. Our team flew to Petersburg, AK and set up a staging ground for a few weeks by the town’s drive-down dock where we finished assembly, extensive debugging, repair, and testing of three full ROSS kayaks. Our time there became extended due to ice density in the channel leading to the glacier, so we ended up spending two weeks in Petersburg, flew back home for a week, then flew back to spend one final week making final changes and performing last minute tests, before staying on the vessel “Stellar” for a week at the glacier. These three prep weeks were absolute insanity and consisted of every possible electrical failure possible including fires, corrosion, failed crimps, dead shorts, PCBs spontaneously failing, electrostatic discharge damage, cable failures, saltwater saturation of PCBs, firmware debugging, etc… We worked incredibly hard over this time fixing each boat’s systems one by one until we had everything working relatively well the day before leaving port. This of course meant that one of our most important magnetic sensors on the rear of the kayak had to die on every single kayak right before packing up the night before we left. A hardware store run for PVC tube, hardware store electrical switches, and a healthy amount of marine grade silicone later, a temporary solution to that problem was taken care of and we headed out the next morning. During the week at sea, our team of researchers and engineers worked 24 hours a day gathering data with ROSS, capturing drone footage, and getting water turbulence and current data. We also deployed an ocean floor mooring in the channel to gather data over the sixth months before we returned. My job on this trip was to help keep the kayaks functional electrically, make repairs when needed, and assist with kayak deployment. I would also drive the kayak manually using our RC controller for the short distances before the ground station on the ship’s bridge that we’d set up took over. Additionally, I’d help with whatever else was needed on the ship, which often included ice poling to keep large chunks of ice from destroying the many tens of thousands of dollars in the form of and Acoustic Doppler Current Profiler that we had hanging over the side of the Stellar. Overall, this was an incredible trip! The views were stunning, as was the sheer enormousness of the glacier. During these 4 weeks I worked more 16 hour days than I care to admit, but ultimately our team got ROSS working and we ended up with a tiny flash drive with a few gigabytes of exciting data that would never have happened without this project.